The world’s largest aircraft by wingspan left its construction hangar this week in California’s Mojave Desert. 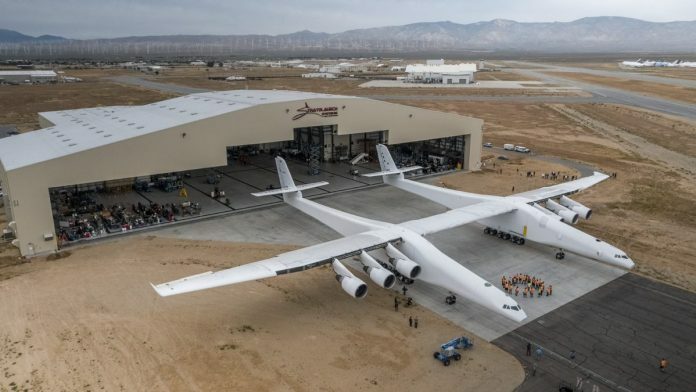 The Stratolaunch is a twin-fuselage aircraft using recycled parts from two Boeing 747-400s that has been designed to lift a rocket (or rockets) weighing up to 227 tonnes and launch it into low Earth orbit. Microsoft co-founder Paul Allen’s company Vulcan Aerospace is behind the project, which aims to revolutionise the satellite launch industry. ‘This is a first-of-its-kind aircraft, so we’re going to be diligent throughout testing and continue to prioritise the safety of our pilots, crew and staff,’ Floyd said. He also confirms the Stratolaunch is on track to perform its first launch demonstration ‘as early as 2019’. However, since the project was founded in 2011, advances in microelectronics have led to the development of so-called ‘cubesat’ and ‘nanosat’ satellites that are much smaller than previous versions and do not require large rockets to launch them. I’m certainly not an aeronautical design engineer but ….it just looks….flimsy? Wouldn’t be there enormous forces and flexure operating on the structure joining the two fuselages in both the horizontal and vertical planes? And a twisting moment in the horizontal plane as well? Why not have a strut between the tailplanes, a la De Havilland Vampire? This concept for launching satellites is great, but will watch the Roc’s performance with interest! I am, Eric, and I share much of your thinking. The torsional rigidity of that inter-fuselage member must be of the highest order, all else being equal. Any severe twisting moment will have one half of the aircraft climbing with the other half diving. OK, that’s stretching it a little but you understand where I head! The controlling electronics will be a tad more upmarket than my MacBook.